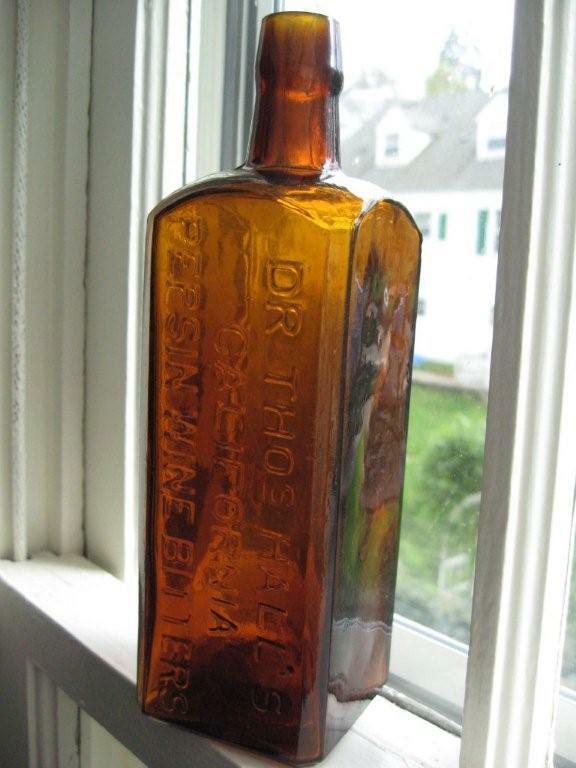 I noticed over on the Oregon Trail Antique Bottle and Glass site a Dr. Thos. Hall’s Pepsin Wine Bitters is being offered for sale. I don’t really know much about the Hall’s bitters except that it is a western product, comes with an applied and tooled top and, the examples I have seen, are a plain amber color. That’s all I had so.. I started to research the Hall’s product and found it was first manufactured and sold by none other than our old Sacramento druggist Justin Gates as early as December of 1869. Dr. Thos. Hall, according to the Gates advertisement, was already pushing up daisies by 1869. By February of 1880 the H.C. Kirk Company of Sacramento were the general agents for the Dr. Hall’s line of medicine and bitters. The pepsin in Pepsin Wine Bitters is an enzyme that is usually obtained from the stomachs of hogs and calves and used as a digestive aid. It also is used commercially in some cheese making, in the leather industry to remove hair and residual tissue from hides, and in the recovery of silver from discarded photographic films by digesting the gelatin layer that holds the silver. Now there’s something I would reach for if I was suffering from dyspepsia or indigestion, wouldn’t you? I sold my Hall's last year, but still have an interesting early trade card for the product. I'll dig around and see if it can be located in all the junk stashed hereabouts.